ITALIAN CYCLING JOURNAL: Stage 15, the "Pantani Stage"
In every Giro d’Italia, RCS Sport/La Gazzetta dello Sport commemorates the achievements of Marco Pantani by naming a mountain stage after him. For the 96th Giro, the Pantani Mountain is the Galibier. Due to snow at the original summit finish on Galibier the finish line has been brought forward 4.25 km to Les Granges du Galibier at the Pantani Monument. The monument commemorates Pantani's Tour de France-winning attack in 1998. The English-language documentary about Marco Pantani is due to be completed in the next few months. “The Accidental Death of a Cyclist” charts the tumultuous life and times of the late Italian star, using archive and contemporary footage, stylised dramatic reconstructions and interviews with Pantani’s family, close friends, former teammates and peers. The film is a collaboration between director James Erskine and New Black Films, who previously teamed up for Italia 90-based One Night in Turin and cricket flick From The Ashes. Erskine’s hope is that the Pantani film can approach the success of Senna, the 2010 smash about the mercurial Brazilian Formula 1 driver. Last week, we sat down with Erskine to get the details on a film which could surpass anything that has come before in cycling cinema. Why did you want to make a film about Marco Pantani? I thought this was an extraordinary story with an extraordinary athlete, unique in that his story combines all the highs of contemporary commercialised sport and all the lows. It feels to me that this was a story on the scale of Senna or Raging Bull, one about a human being and a human tragedy in the sporting world. And that’s what compelled me. It’s about getting to the heart of the man. The Pantani story is really about someone who loves the bicycle. It’s ultimately about why someone becomes a professional in the first place. It’s about love and risk and adventure and seeing sport as an art. I think that’s really important if you’re going to try and make a cinematic film. Senna was an artist behind a racing wheel, Pantani was an artist on a bicycle. How do you frame whether or not Pantani doped? I think we allow the audience to make their own conclusions. But I don’t think the aim of it is to force them into making any conclusions. It’s about stripping away the doping scandals and looking at the real human being behind it. Is it more interesting to examine the question of whether Marco Pantani took performance enhancing drugs or to explore why he had such a tragic end? If you decided that Marco Pantani took drugs, it doesn’t explain the ending. If you decided he didn’t take drugs, it certainly doesn’t explain the ending. What happens to a human being in that situation, one that has won the Giro d’Italia in spectacular fashion, everything that their life has been about, at the very peak of the mountain. That moment when the haematocrit test comes out [at Madonna di Campiglio in the 1999 Giro], he can never get back, he can never be untainted again, even if he was innocent. How anyone could cope with that? It’s supposed to be about suffering going up the mountain. 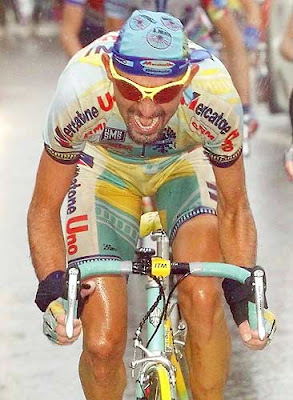 What’s extraordinary about Pantani is this suffering on the way down. When did you come up with the title, which seems a nod to Dario Fo’s work The Accidental Death of an Anarchist? Pretty early on. The nod to Fo was deliberate in the sense that this is the story of a man whose death no-one will take responsibility for, yet everybody is responsible. Also it’s about a corrupt system. I think there’s no doubt now – you might have argued when we came up with the idea – that cycling in the Nineties was corrupt. The relationship between Conconi, the IOC and the UCI indicates a system in which natural justice doesn’t prevail. Follow on Twitter: ITALIANCYCJOURN or receive an email when new content is added using the "Follow by Email" button on the right side column. With more than 2,800 stories in this blog the custom search feature (right column) works best for finding subjects in the blog. There is also a translate button underneath the search button.